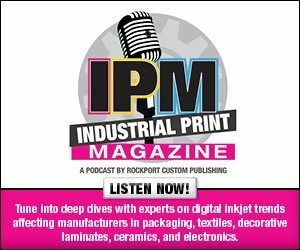 Industrial Print magazine’s first preview of the event, included in our March issue, shared information on the Wednesday, April 10 keynote address from Kristen Denotti, founder, Design Pool and co-founder, PatternPod. A second keynote takes place on Tuesday, April 9. Dawn Olson, director, client business development, production print/industrial print solutions, Konica Minolta Business Solutions, discusses how to accelerate your packaging/label business. How’s Your Altitude?… Morphing Your Packaging/Label Business From a Hot Air Balloon To a Lear Jet offers some simple operating rules for a common sense approach to setting goals for your packaging or label business, mapping a course, dealing efficiently with detours, maintaining your revenue stream, and reaching your desired state of business. Above: Diversified Printing Techniques, booth 424, shows automation in pad printing. InPrint USA is co-located with ICE USA, which is aimed at converting professionals looking for the latest in machinery, technology, and manufacturing solutions. Here, vendors from both shows supply information on what they plan on exhibiting.